Workman Publishing Company, 9780761150206, 205pp. Stand back! Genius at work! 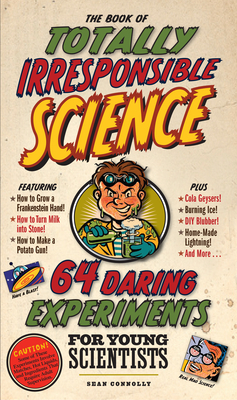 Here are 64 amazing experiments that snap, crackle, pop, ooze, crash, boom, and stink. Giant air cannons. Home-made lightning. Marshmallows on steroids. Matchbox microphones. There’s even an introduction to alchemy. (Not sure what that is? Think “medieval wizard.”) None of the experiments requires special training, and all use stuff found in the kitchen or in the garden shed. You’d be irresponsible not to try them. ATTENTION, PARENTS: Yes, your kids may need your help with a few experiments. And yes, sometimes it may get a tad messy. But it’s not pure mayhem. The balloon rocket whizzing through the garden? It demonstrates Newton’s Third Law of Motion. That chunk of potato launched across the kitchen from a tube? Welcome to Boyle’s Law. Every experiment demonstrated real science, at its most memorable.